The IMS Conversion Is No Longer In Production, this is the orginal text used back when the IMS conversion was being produced. Still to this day however, the IMS conversion carries out it's legacy as one of the most reliable wheelchair ramp vans on the road. As the orginal producer of the Toyota Sienna wheelchair van in 2001, they changed the mobility van industry and opened the door for vehicles to be converted other than the Dodge and Chrysler. Today, you can find almost any van, truck and minivan with wheelchair accessibility modification being made by one of the many manufacturers. IMS was purchased by BraunAbility in 2005. BraunAbility continues to provide parts and service on IMS conversions. In 1984, Chrysler invented the minivan. Today, both the Chrysler Town & Country and the Dodge Grand Caravan continue to be some of the most popular wheelchair accessible minivans on the market. Both Chrysler products are offered in a variety of handicap van packages, allowing you to get the exact features you want in a price range that fits your budget. One of the other great benefits of Chrysler/Dodge IMS Ramp Vans is the Chrysler Door Interface feature. Being able to incorporate Chrysler's factory-installed door motor means IMS vans can link the door and ramp system to Chrysler's OEM remote control. This means that all remote functions -- including locking and unlocking doors and deploying the ramp -- can be performed with a single remote control. 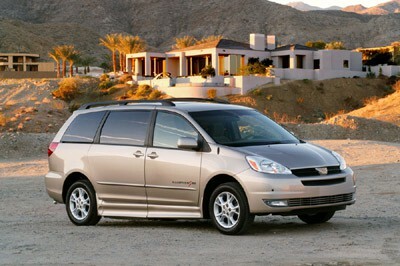 Both the Town & Country and the Grand Caravan have been engineered from the beginning with safety in mind. The minivans' rigid safety cage has steel side-guard door beams, which have contributed to the vehicles' 5-Star side impact protection rating. Both minivans feature next-generation multistage driver and front passenger air bags, and available supplemental side air bags, to protect occupants in a collision. The airbag system senses the severity of the impact, instantaneously adjusting the level of airbag inflation for maximum effectiveness.